Captain Cook`s landing site is the place where Captain James Cook first stepped onto the Australian continent. A commemorative obelisk stands opposite the rock where he is believed to have landed with his crew. A plaque also commemorates the 200th anniversary of Cook`s landing and historical re-enactment. 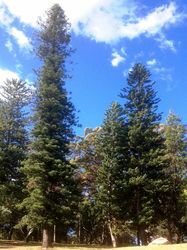 The site has a series of monuments to Cook and his companions, dating back to 1822, which are of historical significance in themselves. 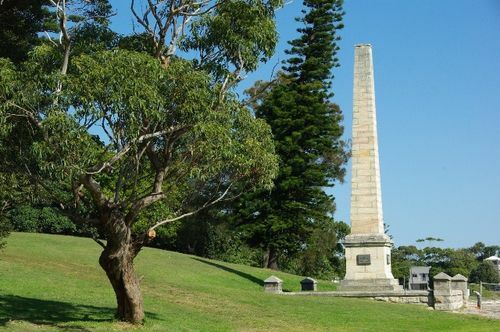 The site includes: a water course believed to be that from which Captain Cook obtained water; a monument erected in 1822 at Inscription Point; an obelisk of 1870; monument to Forby Sutherland, the first British subject to die in Australia; monuments to Dr Solander and to Joseph Banks. By The Honourable Thomas Holt M.L.C. The natives resolutely disputed the landing "although they were by two, and we thirty or forty at least." Parleying with these two continued for about a quarter of an hour. "They remained resolute, so a musket was fired over them, the effect of which was that the youngest of the two dropped a bundle of lances on the rock.... He, however, snatched them up again and both renewed their threats and opposition. A musket loaded with small shot was now fired at the oldest of the two who was about 40 yards from the boat, it struck him on the legs but he minded it very little, so another was immediately fired at him, on this he ran up to the house about 100 yards distant and soon returned with a shield. In the meantime we had landed on the rock." Several "lances" were immediately thrown and fell among the party. This caused two further discharges of small shot, when, after throwing another lance, the natives fled.